is a philosophy PhD candidate at the University of Adelaide in Australia. At first glance, the Cornish mallow (Lavatera cretica) is little more than an unprepossessing weed. It has pinkish flowers and broad, flat leaves that track sunlight throughout the day. However, it’s what the mallow does at night that has propelled this humble plant into the scientific spotlight. Hours before the dawn, it springs into action, turning its leaves to face the anticipated direction of the sunrise. The mallow seems to remember where and when the Sun has come up on previous days, and acts to make sure it can gather as much light energy as possible each morning. When scientists try to confuse mallows in their laboratories by swapping the location of the light source, the plants simply learn the new orientation. What does it even mean to say that a mallow can learn and remember the location of the sunrise? The idea that plants can behave intelligently, let alone learn or form memories, was a fringe notion until quite recently. Memories are thought to be so fundamentally cognitive that some theorists argue that they’re a necessary and sufficient marker of whether an organism can do the most basic kinds of thinking. Surely memory requires a brain, and plants lack even the rudimentary nervous systems of bugs and worms. However, over the past decade or so this view has been forcefully challenged. The mallow isn’t an anomaly. Plants are not simply organic, passive automata. We now know that they can sense and integrate information about dozens of different environmental variables, and that they use this knowledge to guide flexible, adaptive behaviour. What does learning and memory involve for a plant? An example that’s front and centre of the debate is vernalisation, a process in which certain plants must be exposed to the cold before they can flower in the spring. The ‘memory of winter’ is what helps plants to distinguish between spring (when pollinators, such as bees, are busy) and autumn (when they are not, and when the decision to flower at the wrong time of year could be reproductively disastrous). In the biologists’ favourite experimental plant, A thaliana, a gene called FLC produces a chemical that stops its little white blooms from opening. However, when the plant is exposed to a long winter, the by-products of other genes measure the length of time it has been cold, and close down or repress the FLC in an increasing number of cells as the cold persists. When spring comes and the days start to lengthen, the plant, primed by the cold to have low FLC, can now flower. But to be effective, the anti-FLC mechanism needs an extended chilly spell, rather than shorter periods of fluctuating temperatures. This involves what’s called epigenetic memory. Even after vernalised plants are returned to warm conditions, FLC is kept low via the remodelling of what are called chromatin marks. These are proteins and small chemical groups that attach to DNA within cells and influence gene activity. Chromatin remodelling can even be transmitted to subsequent generations of divided cells, such that these later produced cells ‘remember’ past winters. If the cold period has been long enough, plants with some cells that never went through a cold period can still flower in spring, because the chromatin modification continues to inhibit the action of FLC. But is this really memory? Plant scientists who study ‘epigenetic memory’ will be the first to admit that it’s fundamentally different from the sort of thing studied by cognitive scientists. Is this use of language just metaphorical shorthand, bridging the gap between the familiar world of memory and the unfamiliar domain of epigenetics? Or do the similarities between cellular changes and organism-level memories reveal something deeper about what memory really is? Both epigenetic and ‘brainy’ memories have one thing in common: a persistent change in the behaviour or state of a system, caused by an environmental stimulus that’s no longer present. Yet this description seems too broad, since it would also capture processes such as tissue damage, wounding or metabolic changes. Perhaps the interesting question isn’t really whether or not memories are needed for cognition, but rather which types of memories indicate the existence of underlying cognitive processes, and whether these processes exist in plants. In other words, rather than looking at ‘memory’ itself, it might be better to examine the more foundational question of how memories are acquired, formed or learned. ‘The plants remember,’ said the behavioural ecologist Monica Gagliano in a recent radio interview, ‘they know exactly what’s going on.’ Gagliano is a researcher at the University of Western Australia, who studies plants by applying behavioural learning techniques developed for animals. She reasons that if plants can produce the results that lead us to believe other organisms can learn and remember, we should similarly conclude that plants share these cognitive capacities. One form of learning that’s been studied extensively is habituation, in which creatures exposed to an unexpected but harmless stimulus (a noise, a flash of light) will have a cautionary response that slowly diminishes over time. Think of entering a room with a humming refrigerator: it’s initially annoying, but usually you’ll get used to it and perhaps not even notice after a while. True habituation is stimulus-specific, so with the introduction of a different and potentially dangerous stimulus, the animal will be re-triggered. Even in a humming room, you will probably startle at the sound of a loud bang. This is called dishabituation, and distinguishes genuine learning from other kinds of change, such as fatigue. But what about more complex learning? Most animals are also capable of conditioned or associative learning, in which they figure out that two stimuli tend to go hand in hand. This is what allows you to train your dog to come when you whistle, since the dog comes to associate that behaviour with treats or affection. In another study, published in 2016, Gagliano and colleagues tested whether Pisum sativum, or the garden pea, could link the movement of air with the availability of light. They placed seedlings at the base of a Y-maze, to be buffeted by air coming from only one of the forks – the brighter one. The plants were then allowed to grow into either fork of the Y-maze, to test whether they had learned the association. The results were positive – showing that the plants learned the conditioned response in a situationally relevant manner. The evidence is mounting that plants share some of the treasured learning capacities of animals. Why has it taken so long to figure this out? We can start to understand the causes by running a little experiment. Take a look at this image. What does it depict? Figure 1: ‘Leaping Laelaps’ (1897) by Charles Robert Knight. Courtesy Wikipedia. 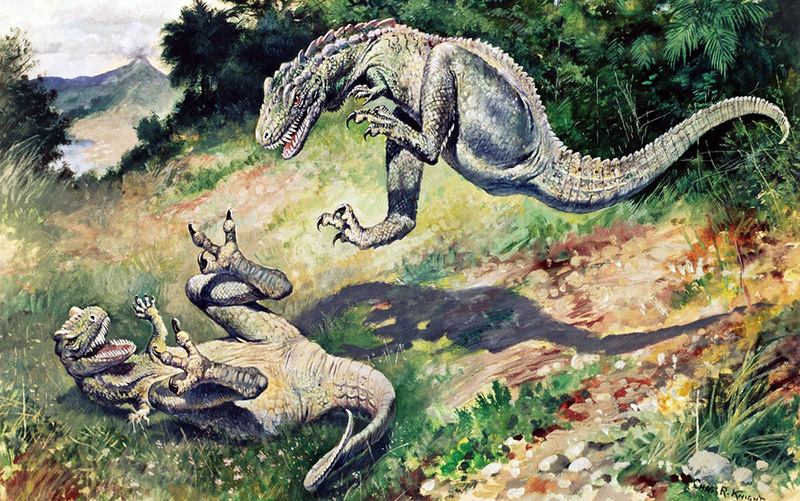 Most people will respond either by naming the general class of animals present (‘dinosaurs’) and what they are doing (‘fighting’, ‘jumping’), or if they are dinosaur fans, by identifying the specific animals (‘genus Dryptosaurus’). Rarely will the mosses, grasses, shrubs and trees in the picture get a mention – at most they might be referred to as the background or setting to the main event, which comprises the animals present ‘in a field’. In 1999, the biology educators James Wandersee and Elisabeth Schussler called this phenomenon plant blindness – a tendency to overlook plant capacities, behaviour and the unique and active environmental roles that they play. We treat them as part of the background, not as active agents in an ecosystem. Some reasons for plant blindness are historical – philosophical hangovers from long-dismantled paradigms that continue to infect our thinking about the natural world. Many researchers still write under the influence of Aristotle’s influential notion of the scala naturae, a ladder of life, with plants at the bottom of the hierarchy of capacity and value, and Man at the peak. Aristotle emphasised the fundamental conceptual divide between immobile, insensitive plant life, and the active, sensory realm of animals. For him, the divide between animals and humankind was just as stark; he didn’t think animals thought, in any meaningful way. After the reintroduction of such ideas into Western European education in the early 1200s and throughout the Renaissance, Aristotelean thinking has remained remarkably persistent. Today, we might call this systematic bias against non-animals zoochauvinism. It’s well-documented in the education system, in biology textbooks, in publication trends, and media representation. Furthermore, children growing up in cities tend to lack exposure to plants through interactive observation, plant care, and a situated plant appreciation and knowledge by acquaintance. Particularities of the way our bodies work – our perceptual, attentional and cognitive systems – contribute to plant blindness and biases. Plants don’t usually jump out at us suddenly, present an imminent threat, or behave in ways that obviously impact upon us. Empirical findings show that they aren’t detected as often as animals, they don’t capture our attention as quickly, and we forget them more readily than animals. It’s often adaptive to treat them as object-like, or simply filter them out. Furthermore, plant behaviour frequently involves chemical and structural changes that are simply too small, too fast or too slow for us to perceive without equipment. As we are animals ourselves, it’s also easier for us to recognise animal-like behaviour as behaviour. Recent findings in robotics indicate that human participants are more likely to attribute properties such as emotion, intentionality and behaviour to systems when those systems conform to animal or human-like behaviour. It seems that, when we’re deciding whether to interpret behaviour as intelligent, we rely on anthropomorphic prototypes. This helps to explain our intuitive reluctance to attribute cognitive capacities to plants. But perhaps prejudice is not the only reason that plant cognition has been dismissed. Some theorists worry that concepts such as ‘plant memory’ are nothing but obfuscating metaphors. When we try to apply cognitive theory to plants in a less vague way, they say, it seems that plants are doing something quite unlike animals. Plant mechanisms are complex and fascinating, they agree, but not cognitive. There’s a concern that we’re defining memory so broadly as to be meaningless, or that things such as habituation are not, in themselves, cognitive mechanisms. On the other hand, some theorists allow that certain representations can only operate ‘online’ – that is, they represent and track parts of the environment in real time. The mallow’s nocturnal capacity to predict where the Sun will rise, before it even appears, seems to involve ‘offline’ representations; other heliotropic plants, which track the Sun only while it is moving across the sky, arguably involve a kind of ‘online’ representation. Organisms that use only such online representation, theorists say, might still be cognitive. But offline processes and memory provide stronger evidence that organisms are not just responding reflexively to their immediate environment. This is particularly important for establishing claims about organisms that we are not intuitively inclined to think are cognitive – such as plants. Overnight, using information from all these sources, the mallow can predict where and when the Sun will rise the next day. It might not have concepts such as ‘the Sun’ or ‘sunrise’, but it stores information about the light vector and day/night cycles that allows it to reorient its leaves before dawn so that their surfaces face the Sun as it climbs in the sky. This also allows it to re-learn a new location when plant physiologists mess with its ‘head’ by changing the direction of the light source. When the plants are shut in the dark, the anticipatory mechanism also works offline for a few days. Like other foraging strategies, this is about optimising available resources – in this case, sunlight. Does this mechanism count as a ‘representation’ – standing in for parts of the world that are relevant to the plant’s behaviour? Yes, in my view. Just as neuroscientists try to uncover the mechanisms in nervous systems in order to understand the operation of memory in animals, plant research is beginning to unravel the memory substrates that allow plants to store and access information, and use that memory to guide behaviour. Plants are a diverse and flexible group of organisms whose extraordinary capacities we are only just beginning to understand. Once we expand the vista of our curiosity beyond animal and even plant kingdoms – to look at fungi, bacteria, protozoa – we might be surprised to find that many of these organisms share many of the same basic behavioural strategies and principles as us, including the capacity for kinds of learning and memory. To make effective progress, we need to pay careful attention to plant mechanisms. We need to be clear about when, how and why we are using metaphor. We need to be precise about our theoretical claims. And where the evidence points in a direction, even when it is away from common consensus, we need to boldly follow where it leads. These research programmes are still in their infancy, but they will no doubt continue to lead to new discoveries that challenge and expand human perspectives on plants, blurring some of the traditional boundaries that separated the plant and animal realms. Of course, it’s a stretch of the imagination to try to think about what thinking might even mean for these organisms, lacking as they do the brain(mind)/body(motor) divide. However, by pushing ourselves, we might end up expanding the concepts – such as ‘memory’, ‘learning’ and ‘thought’ – that initially motivated our enquiry. Having done so, we see that in many cases, talk of plant learning and memory is not just metaphorical, but also matter-of-fact. Next time you stumble upon a kerbside mallow bobbing in the sunlight, take a moment to look at it with new eyes, and to appreciate the window this little weed provides into the extraordinary cognitive capacities of plants.